Do the Benefits Of Taking Sleep Pills Outweigh The Risks? Sleeping Pills – Do the Benefits Outweigh The Risks? How often have you stared into the darkness of your bedroom, frustrated that once again you can’t fall sleep? Do you find yourself reaching for another sleeping pill or thinking about trying one? I know from experience that this is a natural reaction to the stress of not sleeping. When insomnia makes life difficult, it’s natural to want to fix it as quickly as possible. But are sleeping pills the best option? And do the benefits of taking them outweigh the risks? If you search online, you’ll find lots of advice about the risks of taking sleeping pills. And recent medical research into the side-effects suggests it might not always be such a good idea. It’s easy to take the moral high ground and say sleeping pills are bad for you and you shouldn’t take them. But if they reliably help can get some sleep, I can see why you might decide to accept the risks. In this article, I’ll cover some of the main advantages and risks of taking sleeping pills. I’ll also look at some important statistics regarding sleeping pill use among adults, and alternative approaches you can try. Do remember though that if you’re currently taking prescription drugs, it’s important to consult your doctor before stopping or changing your dosage. How many people take sleeping pills? In 2013 the U.S. Department of Health and Human Services sponsored a large US study into prescription sleep aid use among adults. The drugs included sedatives to reduce anxiety and specific sleeping pills. They found that 5% of women in the USA and 3% of men reported taking prescription drugs over the last month to help them sleep. That equates to about 9 Million adults a year taking pills in the US alone. 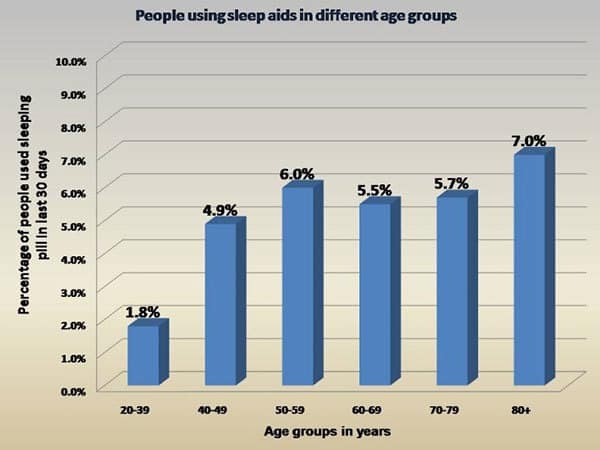 As shown in the chart below, on average more older people took sleeping pills than younger people. In 2012, the Royal Pharmaceutical Society in England conducted a survey of over 2000 people about their sleep problems. Their research suggested that 51% of people with insomnia had self-diagnosed and bought over the counter sleeping pills without consulting their doctor first. 30% of the people who said they have insomnia had been taking sleeping pills for more than a month without advice from a professional. 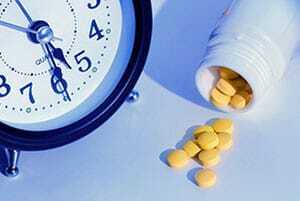 14% of insomniacs had been taking sleeping pills for over six months. 18% of the people couldn’t even remember how long they’d been taking them for. They also identified that 70% of people didn’t know, or were wrong about, how many health conditions can lead to insomnia. In fact, for chronic insomnia, which lasts longer than a month, only 1 in 5 cases are not related to another health condition. For the other 4 out of 5 people, it’s an underlying health condition which is either creating insomnia or existing alongside it, making it harder to treat. In the United States, 1 in 10 people will suffer from chronic insomnia (lasting longer than a month) at some point in their lives. In a country where access to healthcare is much more difficult than the United Kingdom, you might expect an even higher ratio of people to be self-diagnosing and buying sleeping pills than in the UK survey. That might explain why in 2010, sleeping pills and related medicines accounted for 30 billion dollars in the United States. They may mask an underlying medical condition which is interfering with your sleep. Experts say that the priority should be to identify the root cause of your sleep problems. They can have worrying effects on your health and even increase your risk of death or cancer (see below for more about this). Your body can rapidly build a tolerance to the drugs. Some of the drugs can be addictive and therefore difficult to eventually stop taking them. Your insomnia or poor sleep quality can be even worse when you stop taking sleeping pills. They can affect your mental state the next day, leading to lower levels of concentration and higher risks of having an accident. Sleep experts say that sleeping pills might make you fall asleep and stay asleep. However, they don’t guarantee you’ll get the right type of sleep. For example, they may reduce your quantity of deep restorative sleep. They can interact with other drugs, so you need to be careful if you’re on other medication. There are also reports which suggest that drinking alcohol at the same time as taking sleeping aids is very often a bad idea. I’ll cover some of these points in more detail later in the article. Anyone who’s suffered from prolonged sleep problems knows that it can have a negative impact on your physical and mental health. So when feeling exhausted, desperate or stressed by a lack of sleep, it’s very tempting to try anything which might help. They can be very effective in sending you to sleep quickly and keeping you asleep, even if the sleep quality isn’t perfect. If used for a limited period they can be effective in resetting your body clock to sleep at the right time. They are easy to use and don’t require lengthy routines such as relaxation techniques. They are convenient and many of the sleeping pills can be bought over the counter or on the internet. If you have other health problems which keep you awake, then a sleeping pill may be an attractive way to help you sleep. Most of the side effects are well known, so if you’re prescribed them your doctor should warn you about the risks. Many people do trust their doctor’s advice. So if prescribed a sleeping pill, they will take it believing it’s the best solution. Firstly, I’m not a medical practitioner and I would therefore urge you to consult your doctor before taking any action, such as stopping taking any current prescription sleeping pills. Most of the research studies do mention the difficulty in being absolutely sure about the cause and effect and the consequent risk of bias in the studies. For example, can ill-health result in a need to take sleeping aids rather than sleep aids actually causing health problems? The modern and most commonly prescribed sleeping tablets are not chemically addictive in the same sense as many recreational drugs or even nicotine. However, you can develop what’s called a psychological dependence or habit forming condition. In this case, when you stop taking the pills you might find you revert back to your sleeplessness. This can then lead to you experiencing a strong and sometimes overwhelming urge to start relying on the pills again. For this reason, in most cases sleep experts recommend that you only take them for a short period of time. They also suggest that people should slowly reduce the frequency and/or dosage level rather than stop abruptly. There have been a number of studies over the last few years indicating that there’s a significantly increased risk of death for people taking certain sleeping pills regularly. One of the largest cohort studies was reported in the British Medical Journal in 2014. 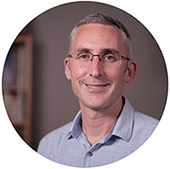 The team compared the medical records of 34,727 patients prescribed anxiolytic (used to treat anxity) or hypnotic drugs (sleeping pills), or both, with 69,418 similar patients not prescribed with any of these drugs. The study looked at the patient’s records for, on average, 7.6 years. Interestingly, they also found that people are often prescribed both of these pills, namely a sedative and sleeping pill (76% of people in the study). They also attempted to adjust their findings to allow for other health conditions which might impact on the results. This included physical and psychiatric problems, sleep disorders and use of other drugs. Their overall findings are that people taking these types of drugs are more than twice as likely to die compared to the comparison group. After excluding deaths in the first year, there were approximately four excess deaths linked to drug use per 100 people followed for an average of 7.6 years after their first prescription. Of course, the overall risk of death is still relatively small. There have been a number of studies which linked the use of sedatives and sleep aids to an increased incidence of cancer. 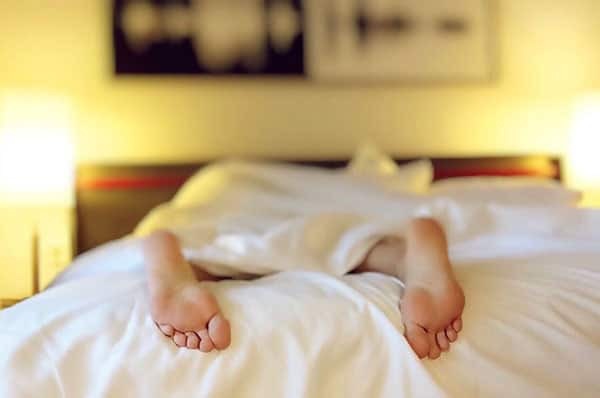 In 2015 a group of researchers from Norway, Finland and the United Kingdom reported the results of a very large study of the use of sleep aids and risk of cancer. They based their work on data from the Finnish Public Sector Study, which they linked to registers of cancer and drug prescription. It covered nearly 30,000 people over a seven year period, of whom 5000 developed cancer. People who took sleeping pills at least twice a week were more than twice as likely to develop cancer of the respiratory system (mouth, throat etc) than non-users. Long-term use, such as for over three years increased the risk even further. The risk was greater for older people than the occasional use by a younger person. If you have an underlying health condition which is causing insomnia, then sleeping pills might not be the best answer. For example, if an illness is making someone cough all night, then a sleeping pill would not cure the cough. And it also might not knock the person out so strongly that a cough didn’t keep them awake. But going to a doctor, diagnosing the reason for the cough and treating it might just mean the illness, the cough and the insomnia are all be tackled at once. 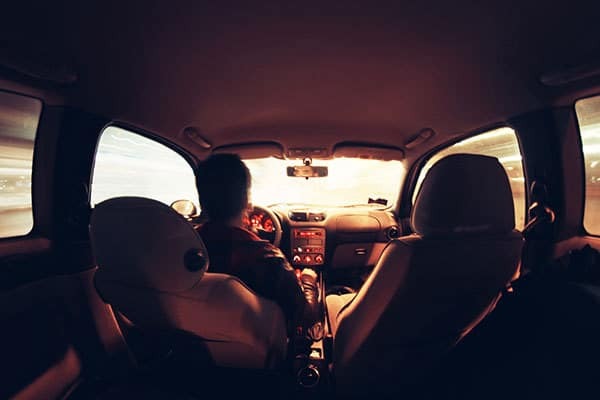 In 2013 Dr. Ryan Hansen of the University of Washington’s school of pharmacy reported on the outcome of a study into the links between some sleeping pills and the increased risk of having a car accident. The team compared the medical and driving records between 2003 and 2008 of 409,171 people aged over 21 with a driving license. Just under 6% of these people included in the study had a sleeping pill prescription for either zolpidem (brand name Ambien); trazodone (brand names include Oleptro); or temazepam (brand name Restoril). Those who took Restoril were 27% more likely to have a car crash over the 5 year period in the study, compared to people who didn’t take sleeping aids. Those who took Trazodone or Desyrel were nearly twice as likely to have an accident. Ambian users appeared to have the greatest risk, at more than twice the rate seen for people who didn’t take sleeping pills. Doses should be reduced from 10 milligrams to 5 milligrams for regular products, and 12.5 milligrams to 6.25 milligrams for extended-release pills. Patients who must drive in the morning or perform some other activity requiring full alertness should talk to their health care professional about whether their sleep medicine is appropriate. Despite some of the alarming research, I suspect many readers will still be willing to take sleeping pills because the benefits will be seen to outweigh the risks. In that case, you might also be interested in some more recent research which might make you think about at least reducing the dosage levels. In 2015, researchers from the Perelman School of Medicine at the University of Pennsylvania undertook a study to compare the effects of intermittent usage of sleeping pills zolpidem (Ambien) against those who used them every day. Group A took a sleeping pill every night. Group B took a sleeping tablet 3-5 times a week. Group C took nightly pills, but half the pills were placebos. The results were very interesting. All three strategies were effective in helping people to sleep. However, the intermittent Group B subjects reported more problems in sleeping and medical issues than the other two groups. Group C, who took a pill every night, but only half of them were real sleeping pills, appeared to sleep just as well as Group A, who took a sleeping pill every night. Our findings also go against the standard practice of ‘start low and go slow,’ in favor of a ‘start high and go low’ dosing strategy in which a patient starts with 10 mg nightly and then when the desired result is reached, switch to either a lower nightly dose or intermittent dosing with placebos on non-medication nights. I think we may well hear more about new dosage and frequency approaches to taking sleeping aids over the next few years. What’s worse – no sleep or taking sleeping pills? If given the choice, most people would probably prefer not to rely on sleeping pills if something else worked. And as you can see, there can be serious consequences to the regular usage of sleep aids. But equally, there are also significant health and other safety issues with not getting enough sleep. So you may find yourself stuck between a rock and a hard place trying to decide between sleeplessness or sleeping pills. I suspect you’ll have tried several different techniques to sleep better, either before trying sleeping pills or returning to them once again. Personally, I’ve managed to more or less get my insomnia under control using alternative strategies, even though it hasn’t been easy. And I have at times resorted to some over the counter sleep aids to help me through difficult patches. I think it’s a personal choice at the end of the day. If you have the time and patience to try out alternative methods to tackle insomnia, it can only be a good thing. If you do decide to go down the sleeping pill route, then I would recommend remembering the advice in this article to keep it to as short a period of time as possible. And during that time perhaps prepare yourself to sleep without them, using natural techniques. If you haven’t already, then you might want to talk to a doctor or medical professional about your sleep problems. Understandably, in some countries like the United States, this may not be an option you want to follow due to the cost. But you have to weigh up the risk of leaving a potentially serious underlying health condition untreated. Because of the risks, I would be cautious about using over the counter sleeping drugs or drugs bought on the internet without first seeking advice from a medical practitioner or pharmacist. Many doctors will also encourage patients to go down the self-help route, by adhering to what’s called good sleep hygiene. This is all about making lifestyle choices and developing routines which will promote healthy sleep. It can be extremely effective if you stick to it properly over time. You might also be interested in reading the article about mindfulness. It includes a section on Cognitive Behavioral Therapy, and some researchers are now saying that CBT can be as, if not more, effective than prescription drugs. And you could even try some herbal sleep aids first. Whilst the evidence is still conflicting about how useful they can actually be, many people still swear by them. If you do take sleeping pills, then you’d probably want to ensure you understand the health risks and be careful not to become dependent on them. Use them sparingly when you have a really bad episode of insomnia, and stop taking them as soon as possible. Sometimes just taking one pill for one night can be enough to reset a better sleep pattern. Have you taken, or do you currently, take sleeping pills? Do you find them a necessary evil, or do you think there’s nothing wrong with taking them? Leave a comment below! Hi Ethan. I’ve been taking sleeping pills for months. I’ve been a life long sufferer of anxiety because of stressful life events and I think all of this eventually impacted my sleep as I got into my 30s (taking hours to fall asleep, frequent awakenings or staying awake all night). I’m also a full time carer for my mum so it’s important I sleep or we both suffer. The doctors I have talked to have been mostly sympathetic and have prescribed me sleeping pills regularly because of my anxiety and my job of looking after my mum so they think I have an exceptional circumstance. So far the medication does work and I don’t abuse the pills. For me it’s often a choice of no sleep or take a pill to sleep. I wouldn’t wish the torture of severe insomnia on anyone. Thanks for your comment and for sharing your experience. I know it’s a difficult decision to make – no sleep or take a sleeping pill. If a doctor prescribes it, then that’s between you and them to work out how long to continue taking them for. My advice would just be to spend time investigating all the different techniques that can be employed to improve your sleep naturally. You could also ask them if CBT for insomnia is available to you where you are. Been having trouble with sleeping properly for quite a while now. Like a lot of people here, ive tried sleeping pills and I found it does work but wake up sooner than i would if I slept naturally. I have a job I do daytimes 7 days and an evening job I’ve just started 5 days a week. Don’t want to really but I have debts to pay and want to have some money left after bills to save. I am trying to get a nap in between the Two job’s but I am not used to sleeping late afternoon early evening . If any of you have a job where you can get away with a nap when required I would say do so. Or if you can at lunch break. Thanks for your comment. It sounds like you’re working very hard there – I’m not surprised you feel the need to get some extra sleep in. Taking sleeping pills probably isn’t a sustainable plan in your case. If you can power on through with a healthy diet and as stable a sleep pattern (with or without a necessary siesta), that would be better in the long run I imagine. Great article but what do genuine insomniacs do then to get off? I have taken sleeping tablets for about 10yrs and tried to stop several times. The truth is I can not shut down. I would have serious anxiety and work full-time and have stared at the ceiling from 10 o clock at night till 7 in the morning, I wouldn’t wish it on my worst enemy and also, when you do go 3-4 nights of staring at the ceiling you enter a totally different world. The insomniac is a tortured soul and I don’t think clinicians and those who don’t suffer actually get it. I have no other option than to take sleeping tablets. Try doing 4 nights of no sleep and keeping a fulltime job, you can’t. So my options are, never sleeping, losing reality, and losing my job, or banging a pill that knocks me out because I can’t knock myself out and being able to function the next day for work and everything else that comes with it. It all comes so quickly now that I don’t have the time nor will people accept it as a real problem to begin with. This world just spins to fast for some of us and we can’t stop it. I’m tired being tired. But work tomorrow, it never ends. Thanks for your comment and compliment. I can understand your frustration, believe me! I think 10 years is a very long time to be taking sleeping pills, so it’s worth investigating what options you have. Have you looked into cognitive behavioral therapy for insomnia? There are some good online programs you could consider, or you could ask your doctor if they can refer you to a therapist in person. And as a sufferer of anxiety myself, I think it’s worth tackling that too. Not just with short relaxation exercises, but with a more concerted effort during the daytime. There are lots of self-help books, websites and courses you can make use of. A particular favorite of mine is mindfulness if you haven’t heard of it. It was nice to know that sleeping pills can be used to reset the time clock of the person and allow them to sleep at the right time. I am guessing that my sister is planning to use sleeping pills for this purpose only. After all, she has only started losing sleep recently, she must be very worried since her condition is not usually like that and wishes to resolve the issue. I’ll support her. Thanks for your comment. It might indeed be why she’s chosen to try melatonin. It’s nice that you’re planning to help her with her sleep issues. Thanks for your comment. Have you spoken to a doctor about the numbness? There are lots of possible causes, and it’s important that it’s diagnosed correctly. A great read. I am in my 40’s and have struggled on and off with insomnia over my whole life. I have always wrestled with the issue (im someone who tries to take as little prescription drugs as possible). I however found the occasional pill when I was really struggling at least helped me get a nights sleep so I could get through the week. I set up some ground rules when I decided to take a pill 10 years ago (after trying every natural solution possible). I take a pill a maximum of one night a week and a maximum of 3 pills per month. There have been years I have taken as low as 5 pills and some as many as 20. I find this occasional approach has allowed me to function ok – its not optimal for sure but it may work ok for some (like me). Just thought I would share my experience. Thanks again! Thanks for your comment and for sharing your experience. I like the idea of having limitations and using them more as a backup plan. I do the same with earplugs – I always try to fall asleep without them at first, but have them handy in case I really can’t. Just knowing you have a good solution available can help you relax and sleep better I think. I have found your articles to be very interesting and informative. But I have an issue which I would appreciate receiving some advice on. I have developed a major problem with not being able to sleep normally, after being on a benzodiazepine for the last approx. 18 mos. (first it was Ativan; then I was put on Valium to get off the Ativan). I tapered off the Valium by late November 2017. Since then I have been struggling with insomnia, no doubt induced by the benzo usage. I have tried a number of “natural” remedies, to no avail. I am wondering what I can do about this, and whether you have any knowledge about how long it might be before I will start sleeping “normally” again. Prior to going on the benzos, I didn’t sleep too badly overall. (Had some bad nights, but nothing unusual). I haven’t received much help from the GP I have been seeing, and am feeling extremely exhausted and discouraged about it. And I am strongly tempted to start taking some sleeping pills, at least for a while. But I do not want to become too dependent on them either! Any advice/suggestions you can pass on would be most appreciated. What can I take to restore my old ability to sleep? Thanks for your comment. It can take some time to get back into a normal sleep routine after such a long period of having help from strong medication. Don’t despair, and give it more time! Have you seen the articles in the sleep hygiene section? I definitely recommend going through all of them and trying to put as many of them into practice as possible and applicable. In the meantime, if you do have some bad nights, and feel you need some extra help, you could try some herbal remedies. Maybe even just start with something light like valerian or chamomile tea to see if that helps you relax. Hi. Always interesting to hear other people with sleep problems experiences. I have had 5 or 6 major periods of insomnia in the past 30 years, which I dealt with firstly with sleeping pills but finally by reaching some point of acceptance (not easy) as I became terrified that I’d get to the stage of never being able to sleep without them , and that they would inevitably lose effectiveness so I’d be back at square 1. In the interim periods I have used pills on odd nights which have been difficult, and still do, the problem now being often waking very early which is a pain if you have a full day ahead…that seems a pretty common experience.Luckily I find I can take a zop (or half) then without any after effects on waking, prob as I am pretty habituated. As you said, its a balance between health risks of the meds that now seem to be emerging, and quality of life. Sleep deprivation carries a health warning, which in itself adds to the anxiety and therefore to the insomnia and now so do the meds apparently! Thanks for your comment and for sharing your thoughts on sleeping pills. I think you’re right to be aware of the risk of becoming dependent on them, and so to use them wisely and sparingly if you can. There are lots of practical things that can be done to improve our sleep, such as the ones you mentioned. Funnily enough, I just got into audio books recently, and do find some of them are read in such a monotone, I can sleep to them! But if I’m really wide awake, I end up focusing too much on them. If you have a problem with a busy mind, I can also recommend mindfulness for sleep, which can work really well. Can you recommend a website in the Uk that i can buy zoplicone? Dont want to end up with rat poison? I can’t recommend one, sorry. There are ways to find out if an online pharmacy is reputable or not in the UK, so I recommend being careful with researching them. Thanks for your comment. I can understand how life must be incredibly difficult if you never get the sleep you need. It’s stressful, exhausting and hard to function properly. Have you every had a proper sleep study done? If you’ve had such bad sleep problems for so many years, it’s a good idea to get a professional assessment and support. And have you ever tried cognitive behavioral therapy for sleep? It’s a growing concept that has proven quite successful, so I recommend having a look at that article to learn more about it. (Clonopin and Tamazopan) of which now have been linked to early onset of dementia. Looking back I honestly think my sleeplessness was more related to having ADD and not being able to shut my brain off and to a hormone imbalance after a hysterectomy. After taking the above medication for 3 years they have switched me to Clonine and I feel terrible! I am not sleeping and if I do it is interrupted sleep all night long. Of course I am so fearful of not sleeping, after what I went through. I spent last night on the internet looking at relaxation techniques and found your article on mindfulness. Being in the moment. I am hopeful of being able to work on becoming mindful and letting go of the anxious thoughts and not worrying about will I be able to go to sleep! Thank you for being transparent concerning your own struggles of insomnia. I wish I had found your site earlier before the Clonopine and Tamazopan. Thanks for your comment and for sharing your story. It sounds like you’ve really been through a lot. It’s great that you found the article about mindfulness, and that it seems like something you’d like to do. I’m a big advocate of mindfulness as I had such positive results from practicing it myself. I do recommend getting a book on it, ideally one with a CD with exercises to practice. It’s a nice way to learn about it and work through the different exercises. Thanks for your comment. I’m afraid there’s not much I can do to help you personally! But I’d say if you have a history of drug dependency, it’s important to work with your doctor to find the best medicines possible, and preferably ones that aren’t so addictive. If you are into meditation and spirituality, then there are lots of natural techniques you can practice to help you with both depression and insomnia. Perhaps a good place to start would be my article about mindfulness. You might find that a useful read, with practical ideas for tackling your sleep and mental health difficulties in a natural way. Thanks for your comment. I can understand your point of view, and at the end of the day it’s a personal choice whether to take sleeping pills or not, though better done with the support and advice of a medical professional I think. But if you feel it makes an important difference to your quality of life, I can see why you could accept that. I have always had a problem with falling asleep at night, and I am finally ready to do something about it. My doctor recommended that I consider taking sleeping pills, but before I agree I want to know the benefits of using them. It’s good to know that if I were to use them, that they are convenient and get be bought over the counter. Which would be great that to be able to find the one that works right for me. Pretty sure my insomnia has taken years off my life and made me very ineffective many days. Thanks for your comment. You’re right in that insomnia can cause all manner of problems in the long term. You can find out more about this by researching the effects of sleep deprivation. I know it’s a classic conundrum – whether the effects of not sleeping are worse than the effects of long-term sleeping pill use. And one that for many people doesn’t have an obvious answer when they feel like nothing else helps them sleep. I have one of the worse cases of Restless leg syndrome. The only medication that calms my legs also keeps me awake all night. I have gone days and weeks without hardly any sleep. So unfortunately yes I have to take sleeping tablets. I take them about twice a week to guarantee some sleep. I can’t win on this one. Thanks for your comment, and sorry to hear you’re having that dilemna. Have you seen an article I wrote about new restless legs syndrome treatments? There may be something in there, or the readers comments after it, that interests you. This article resonates with me as last week I resorted to prescription sleeping pills (Zopiclone) for the first time. For the last few years I’ve been experiencing chronic insomnia during the winter that recedes more or less when the clocks change in March. In summer I get the odd bad night’s sleep that I make up for the following day but in winter I would sleep only 4-6 hours and never recuperate at the weekend. Last winter I was idealistic trying to solve it with exercise (but not late in the evening), cutting out alcohol and caffeine in the evening, vitamin and mineral supplements and herbal teas. These didn’t work particularly well and after a third sleepless night in a row followed by another sick day, I decided enough was enough. I’ve decided to take them only when really necessary and keep the dose as low as possible, while maintaining the same strategies with alcohol, caffeine exercise and vitamins and minerals. Thanks for your comment. I can understand why you’d want to try a sleeping pill after struggling to sleep. It’s also good that you’ve decided to use them only when necessary and keep working away at the natural techniques. It can take a little time to get into a good rhythm with the natural techniques, but it’s well worth persevering. Thanks for your comment. Some will be, but many are fine. If you buy them from reputable websites, it’s a safer way to be sure. Personally, unless I know the business, I’d never buy from a website like “buysleepingpillsonlinecheap.com” or something like that. Trazodone gave me the worst hangovers I ever had.Ambien works well for me at the 5 mg.dose with no hangovers.Something that works almost as well as ambien is 200-400 mg.of magnesium citrate and 20 mg. of b6. Thanks for your comment. It’s very interesting to hear you found that simple magnesium and b6 supplements helped you nearly as much as ambien! It would be great if everyone had good results from supplements which don’t carry the same risk and potency as prescription sleep aids. I have been a Mental Health and Addictions Rights Advocate for more than a dozen years, and have taken more medications than I can remember in the last almost 30 years as a patient, and trazodone or desyrel is a really old tricyclic anti-depressant that had the side effect that it was very sedating so is now used as a sleeping pill but in a dose much lower than as an anti-depressant. Temazepam is a benzodiazepine which is long acting and may cause drowsiness the following day, I currently have a prescription for Dalmane or flurazepam, the first marketed for sleep I believe and definitely the longest acting. Ambien is chemically different than the benzodiazepines but binds to the same receptors in the brain, but is shorter acting typically avoiding day time drowsiness. But if taken during the day and you don’t sleep it can cause amnesia, so can Temazepam and Dalmane, you forget things after taking the drug which is usually right before sleep and not a problem. I have been on Mogadon or nitrazepam and Rohypnol is flunitrazepam. The benzodiazepines however disrupt stage 4 deep sleep. I question some of the statistics like the ones for cancer, and have a B.Sc. in Statistics but overall a lot of good info. Thanks for your comment and for all the useful points you make. I imagine you have seen a wide range of misuse of sleeping pills in your time, and it sounds like you have a lot of awareness based on your own experience. I’d be interested to know what your overall thoughts are on the use of sleeping pills generally.